The easiest way to learn human anatomy in the lab is to have a framework in your head before you start. Just like naturalists do when they’re out looking for specimens in the wild. 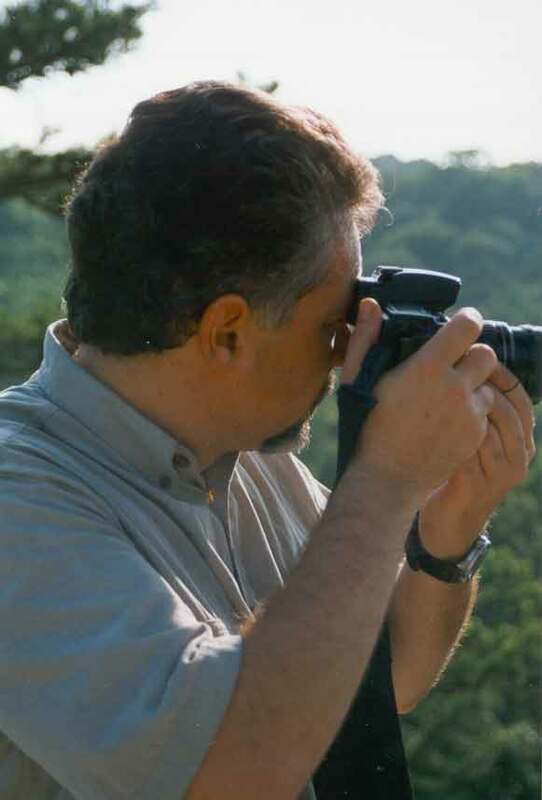 For example, bird watchers learn how to spot and identify birds quickly by learning a framework (or “system”) before they start learning their birds. Naturalists have to spot birds even more quickly than the lab timer sends you on to the next question in your lab practical—birds are quick and often don’t hang around waiting until you can identify them! How do they do it? Roger Tory Peterson worked out a great system in his famous Peterson Field Guide series . We can easily adapt the systems used in such field guides for identifying and learning features of the anatomy of the human body. One of the first things you need to know is where would you find the feature you are looking for? Birders (bird naturalists) use range maps to figure out where to find a bird they want to find. This range map from a Peterson field guide to birds highlights the areas one is most likely to spot a black vulture. Such range maps can also help a birder check to see if an identification they made is accurate. For example, if one is in Alberta, Canada, it’s unlikely that the bird they see is a black vulture. In human anatomy, it’s important to realize where a feature is found. Orientation diagrams, anatomical charts, tables, and other sources can be a sort of “range map” to tell you what region of the body in which a particular feature is likely to be found. This human “range map” tells us where in the breast we can find different tissues. For example, we can find dense fibrous connective tissue (9) surrounding the lobules (3) and milk ducts (6) of the breast. If you scroll down to the next section, you’ll see this connective tissue surrounding a milk duct. Another method used by naturalists for field identification is the use of field marks. Field marks are things one looks for to distinguish similar types of organism from each other. For example, one can easily distinguish a black vulture flying overhead from the similar turkey vulture using field marks. 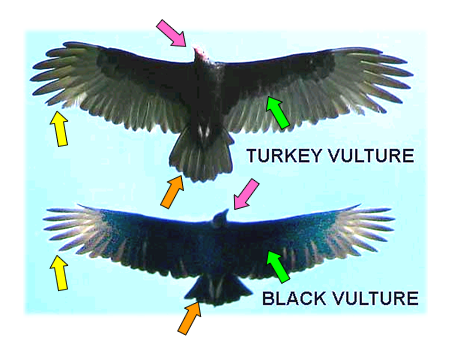 A quick look at the shape of the wing tip (yellow arrows), head color (pink arrows), color pattern of the body and wings (green arrows), and tail shape (orange arrows) allows one to easily distinguish a black vulture from a turkey vulture. In human tissues, similar specimens can be distinguished easily when you know their unique characteristics (field marks). 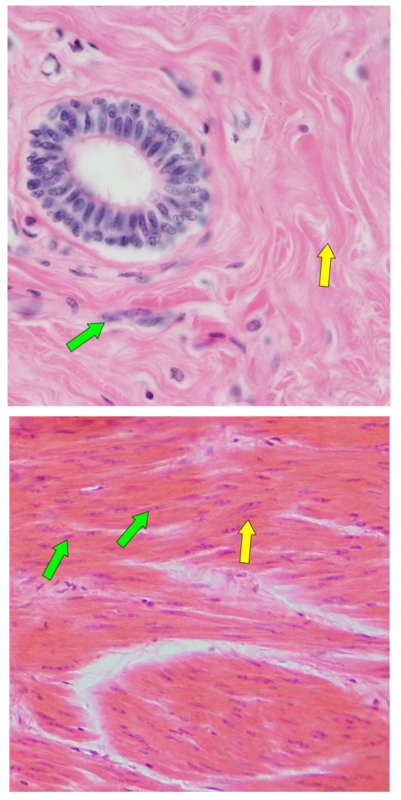 It’s not always easy to tell the difference between dense fibrous connective tissue (top) and smooth muscle (bottom). At a glance, they are very similar. To tell them apart, one can see that the dark “oval dot” nuclei (green arrows) tend to be “bunched up” in groups in the fibrous tissue but more evenly distributed in the muscle. 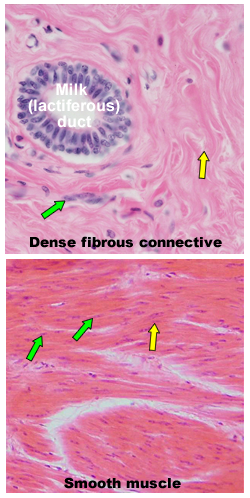 One can also see that the pink collagen fibers resemble the pink muscle fibers (yellow arrows)—but are not uniformly dotted with dark nuclei in the fibrous tissue. A classic idea in field biology is the ecological niche. The niche is the “role” that an organism plays in the interactive drama of life. For example, vultures are scavengers. So a large bird that slowly circles above a dead animal is likely to be a vulture. A large bird on the ground over roadkill is likely to be a vulture. So knowing the niche of an organism tells one the context and behavior (function) of an organism. How does that apply to human structures? If one knows about the functions and context of various structures, one is more likely to be able to successfully find those structures—and more likely to know what a structure is when found in a particular spot or performing a particular function. For example, knowing that most epithelial tissues form membranes that cover structures or line hollow structures (cavities or tubes), one can find them easily among other tissues. Knowing which epitheilia tissues work best for absorption or secretion (simple, one-layer membranes) and which work best for protection (stratified, multi-layer membranes) help one identify them—and remember which is which. So the best way to learn anatomy is to simply keep looking for structures. Try to enjoy it . . . sort of like a bird-watching hike or a game drive on safari in Africa. Just by doing it, you are learning. The remembering will come easily if you’ve been “out in the field” enough. In my lab manuals, tips on using this method can be found in the Landmark Characteristics boxes scattered throughout. So if we’re not looking for birds—but are instead looking for tissues, bone markings, muscles, and other human structures—how do field identification methods help us? It’s a useful way to know what to look for when learning anatomy—and provides a useful framework for quickly remembering structures when you encounter them.